I have frequently seen (and photographed) Omega Centaurus (NGC5139) from SW Florida (Fort Myers/Lee County). Along with ACRUX, Canopus and Alpha Centauri are also visible and very nice! Wish I could see NGC104 from here … but alas … will have to live with my memories of viewing 47Tuc and the Magellanic Clouds from Chile on several trips and Australia on several trips. The splendor of the Milky Way is incredible from the Southern Hemisphere. Thanks, great info. 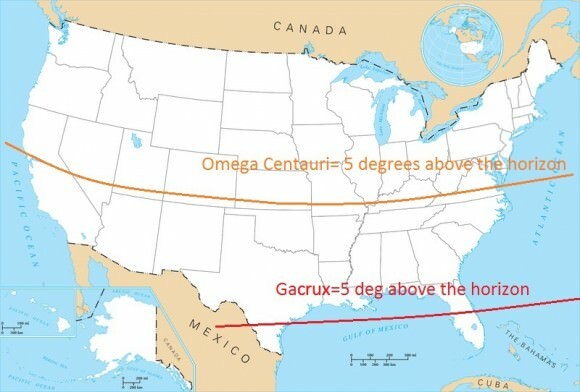 Noted our error of confusing Acrux and Gacrux in the article (and the map) and corrected it. Thanks for bringing it to our attention. My own personal “best” was a sighting from just south of Columbus, Ohio (~40 degrees N latitude) using an 8″ Celestron. Views from my current site(s) in central Florida are decidedly better. I’m at 38* 31′ N and have seen Omega Centauri in multiple viewings from the tops of nearby coastal mountains. Seeing it that first time was comparable to first sighting(s) of Jupiter or M 13? C. Hale/Bopp? On the coast, some 75 miles northwest of San Francisco, when the fog covers the cities, and a laminar ocean flow condition prevails.. c’est magnifique! oui?